never purchase milk from a hong kong "dairy." 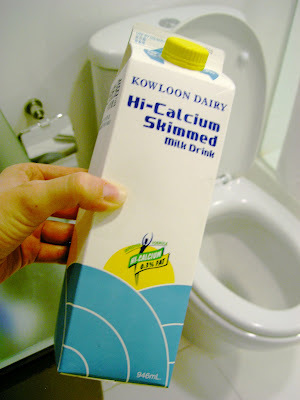 my gut told me not to, but i was desperate to enjoy a hearty bowl of raisin bran with ice cold milk, and a carton of skim from the kowloon dairy (kowloon is a heavily populated district in hong kong -- and i ain't never seen a cow there) was the only option left at the corner market last night (now i know why). bless your heart. i really don't know if i could manage ... i usually partake of cereal 2 times a day. and there really isn't anything worse than bad milk. i shudder at the thought. OK, a few clues....milk drink? Doesn't the word "milk" imply the drink? I'm with you on that one, the milk in Uruguay tastes like weeds...yum! is it just me or does that milk have a yellowish hue to it? like foot?! that's hilarious! and sad. i had a roomate who liked orange juice on cereal. hope you find a better substitute. yuck. i won't even ask how you know what foot tastes like. that's just gross. cereal is the cure to anything. i'm so sorry. btw1, i count baby einstein as tv. although we never got into baby einstein. i read somewhere that it isn't really educational. and eli wasn't into tv until recently. btw2, dallas needs an h&m in a major major way. btw3, i think i need to see another belly picture. btw4, i'm so excited for you to come back and join in on some mommy fun. oh sister, i'm so sorry. i don't know how you do it over there! jeff and i pretty much live off of cereal. maybe you should just come home? ok.
That is crazy. Lesson learned right. Craziness. 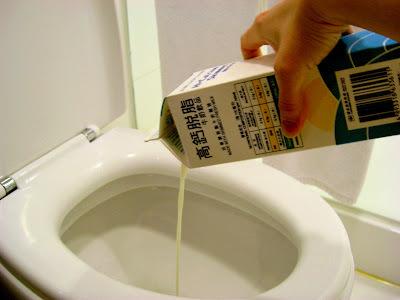 Yeah, you have to be careful when you drink milk from other countries. At least they sell it cold for you. Must countries drink it warm!! That is one thing us Americans have going for us....ice cold, tasty milk!!! I am a friend of Angela Newman's. I served my mission in HK. I about spit when I read you bought mild from the Kowloon Dairy! I hear ya sister, I missed the milk while I was there and I could never get past the soy milk. I bought myself milk for christmas and it tasted terrible but I ate it with cereal anyways because it was $20.00.